Mountains of Northwest Oregon and Southwest Washington between latitude 44N and 48N. Moist maritime climate. Cool temperatures, high precipitation. Annual precipitation 1960-2410 mm. Three quarters of precipitation falls between October and March as snow. Mid to upper elevations. West slopes of the Cascade Mountains. Prefers moist deep cool well-drained soil. However, can grow on a wide variety of soils including rocky if there is enough moisture. Takes sun to part shade. Does not tolerate high wind or soil with high pH. Associates with most Northwest confers throughout the range, Alaska huckleberry, red huckleberry, Cascades azalea, Pacific rhododendron, bear grass, fawn lily, inside-out-flower. Seeds are dispersed in September - October. 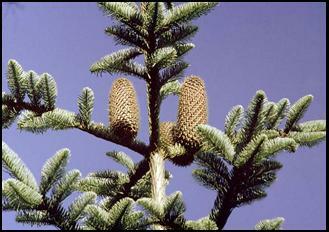 Noble fir starts to produce seed around 50 years of age. Time between good cone crops could be up to 6 years. Seed quality is poor. Good seed quality usually correlates with good cone crops. In landscape settings grows to 50-100 feet tall. In native habitat grows 180-270 feet. A noble fir that is around 100 years old is usually 90-100 feet tall. Very young trees have a slow growth rate, growth rate increases to moderate. Burns, R. and B. Honkala. 1990. Silvics of North America, Volume 1, Conifers. Agricultural Handbook 654. U.S. Department of Agriculture, Forest Service, Washington, D.C.
Dirr, M. 1998. Manual of Woody Landscape Plants. Oregon State University Extension Service and Oregon Department of Forestry. 1995. Trees to Know in Oregon.